Global warming, climate change, survival of human race on Earth and related ignorance-come-jokes by President Trump remain the talk of the town these days. Think tanks, policymakers, and NGOs concerned about the future of Earth are stressing upon the need to save planet by limiting the human activities, responsible for spreading toxins. Well, the question is how human beings are contributing to the destruction of Earth, a planet that has been providing them ideal conditions to support life. Let’s have a look at it. Last year a WEF (World Economic Forum) report listed climate change among the four major global risks that the world is facing. The most common culprit held responsible for much-heralded climate change is global warming which is causing an increase in the world’s temperature. So, what is making the world hotter; Is it because gases in the core of sun are burning more than ever giving rise to temperatures, or is it because of human beings who are ruthlessly exploiting the Earth’s resources. According to available resources increased greenhouse emissions are mainly responsible for increasing Earth’s temperature. There are certain gases present around the Earth’s atmosphere that trap the heat radiating from Earth’s surface. These gases that remain physically and chemically unaffected by the heat remain around the Earth permanently and include Nitrous Oxide, Carbon Dioxide, Methane, and Water Vapors. While a continuous presence of these gases helps keep the Earth’s temperature moderate, making it liveable for inhabitants, an increase in their quantity leads to increase in global warming. 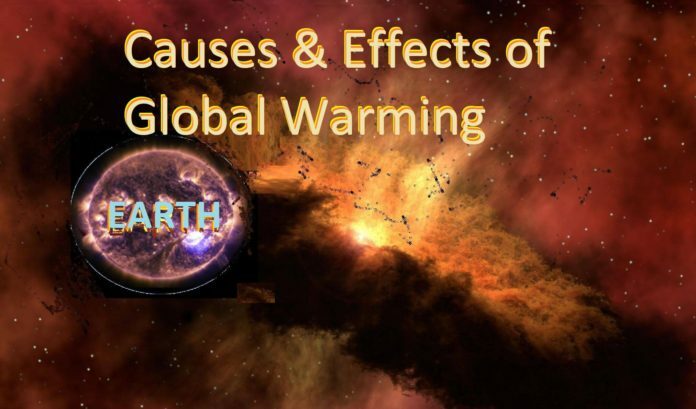 Now, the real reason for global warming is the increase in these greenhouse gases as a result of human activities. Burning of fossil fuels for obtaining energy, decay of waste in landfills, deforestation and clearing of land for other uses are few activities to name that increase these gases to atmosphere. While there are countless human activities on land that contribute to excessive atmospheric pollution, two of them make the most out of it. combustion of fossil fuels as an energy resource and clearing of forests for agriculture and land are major reasons for the addition of carbon dioxide in the atmosphere. Deforestation leads to the reduction of trees that can otherwise absorb carbon dioxide (CO2) release oxygen and combustion of fossil fuels release carbon in the air that in turn binds with atmospheric oxygen to form CO2. The adverse effect of global warming is in the form of climate change which is seriously affecting the life on Earth. Increased temperatures are causing glaciers to melt and thus flood the oceans, reducing inhabitable land space. From the last couple of years, the world is also seeing some extreme weather conditions in the form of long summers and unexpected snow-falls in some areas, during the winter season. Such a change in the Earth’s temperature due to global warming was prominent after the industrial revolution, that increased human reliance on fossil fuels. We have seen that blind development and sustainability of Earth’s resources and ideal climate conditions can’t co-exist. In such circumstances, human beings either need to slow down the pace of development or they need to show more responsibility by taking measures. For example, innovators can look towards the sustainable business ideas that can not only contribute economically towards but also keep the resources of this planet intact.